Every week, football pitches up and down the Harrogate district play host to a bundle of men’s, women’s and junior fixtures. 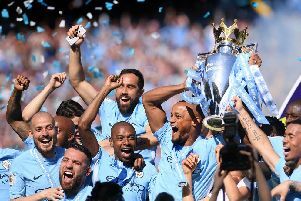 In stark contrast, money at the top of the game has hit record levels and this week the Premier League announced a bumper four-year television deal worth £5.14bn. The deal means Sky Sports are paying £10.8m per match they broadcast and BT a mere £7.6m. Shadow minister for sport Clive Efford said: “It would be nothing short of criminal if none of this extra money goes to expand participation at the grassroots of football. With that in mind, the Harrogate Advertiser Series is calling on readers to join our Support Grassroots Football campaign to boost participation levels and improve facilities across our area. Last year, the Harrogate Advertiser revealed more than 30 per cent of clubs had left the Harrogate and District Senior League since 1995. In the Claro Sunday League, there are five fewer teams playing now than three years ago. In that time, the Premier League’s television income has risen from £191m to the billion-pound deal for 2016 to 2019. New figures have revealed the number of adult males playing 11-a-side football in the West Riding has fallen by almost 15 per cent in the last six years, from 1,336 to 1,151. Over the next few weeks, the Harrogate Advertiser Series will delve into the current problems clubs are experiencing with weekend football and showcase examples where trends are reversing. Several managers have spoken out over the hardship of finding committed players, and many have complained about a lack of 3G facilities across the area. The West Riding County FA has outlined areas that it believes are key to reversing the downward trend. It has implemented a Grow the Game strategy looking into alleviating lack of facilities, improve youth to adult transition and addressing the culture shift that has turned players away from the game. “Football is in decline and we have to hit it head on,” said Tom Dent, West Riding football development officer. A petition to save grassroots football, with 30,607 signatures, was submitted to the government this month encouraging the FA to ensure 7.5 per cent of broadcasting rights went to the local game. In response, the culture, media and sports department said £850m will be redistributed from the Premier League to help strengthen football below the top tier over the next three years. Of that, £168m will be spent solely on grassroots football. The e-petitiion remains open for signatures and will be considered by the Backbench Business Committee if it passes the 100,000 signatures. l Have your say on the future of grassroots football by emailing sport@harrogateadvertiser.co.uk or ed.white@jpress.co.uk.